We thought we were doing “okay” in the clutter department. I like to keep things I might use again and my husband likes to get rid of things. As a compromise, I have a garage sale- religiously- every year. Anything that doesn’t sell gets donated, never to be seen again. 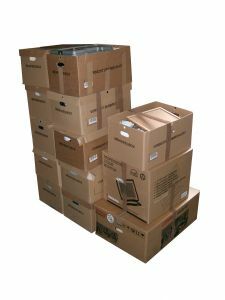 However, as we put our entire lives into boxes, we were shocked at the sheer mass of it all. Where did it all come from? How did we collect so much stuff? It made me think about a lot of things as we hoisted it all into our new house and filled up the 2-car garage that had been so carefully cleared for our arrival. I wondered how much of the boxes, bags and bins we really needed? As I began unpacking, I decided I would not put anything we really didn’t need into the new house. I grabbed some empty boxes, wrote “Garage Sale” on them, and started filling them with things we wouldn’t use. I wonder how much emotional “stuff” we are all holding on to? Are we dragging our past anger, grief, sadness and bitterness everywhere we go? Let’s clear out our emotional baggage and over-filled boxes and make more room for the good “stuff” in life.